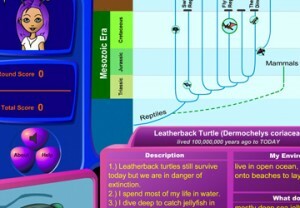 Life Preservers is a video game that teaches National Science standards on evolution, adaptation, and the history of life on earth. It is an engaging, fun, pedagogically rich learning experience that can fit within a single class period. Life Preservers was funded by the National Science Foundation. It was created by the Games for Entertainment and Learning Lab and is copyrighted by Michigan State University, 2005. The project is conducted by Professor Carrie Heeter (heeter@msu.edu), Brian Winn (winnb@msu.edu), and colleagues at Michigan State University. We welcome your comments and feedback. Using Life Preservers, we have conducted research on gender, science games, play style, and learning. To give teachers flexibility when they use Life Preservers in their classroom, we created a long and a short version of the game. The short version has only one round, THE AGE OF DINOSAURS. The long version has that same identical round and then continues to THE AGE OF MAMMALS.